This is an ice cave I visited at the end of December 2013. This cave is in the Öræfajökull outlet glacier which is part of Vatnajokull, the largest ice cap in Europe. It is not that easy to touch this cave. We began with an exciting off-road ride and walk over a dry riverbed full of ice and puddles, then hiked up to the glacier until we reached the cave entrance. The rough part is you have to walk against 20m/s to 30 m/s wind. However, it was totally worth. As you can see, a deep crystal blue with all sorts of neat definition and contrast in the ice suddenly appeared in your eyes. 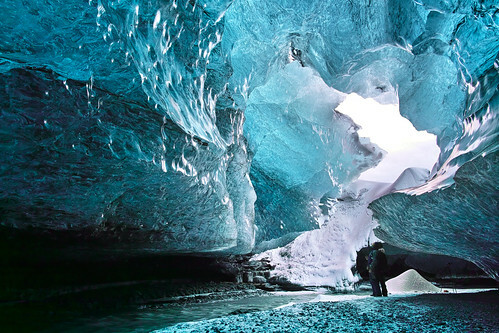 Most beautiful thing is various reflections of ice through sunlight produce a gradient blue inside the cave. It is definitely one of the most amazing things I’ve ever seen in my life.